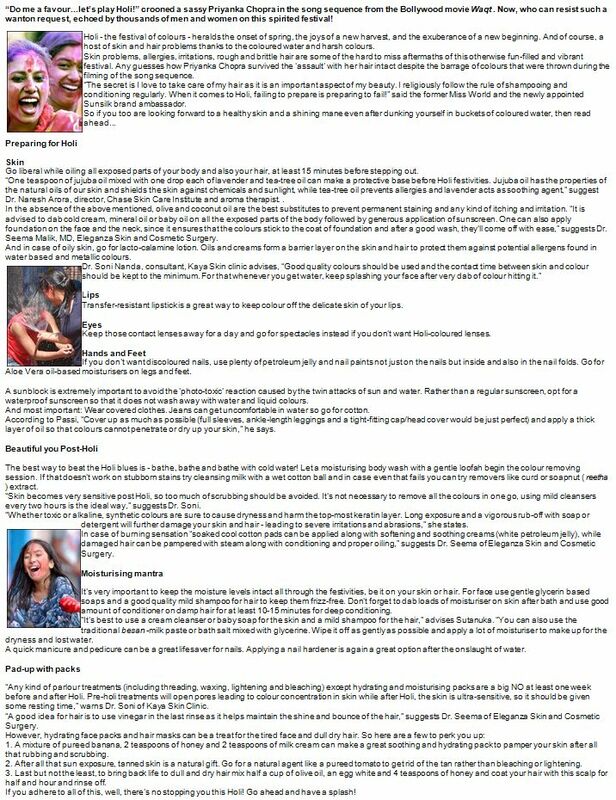 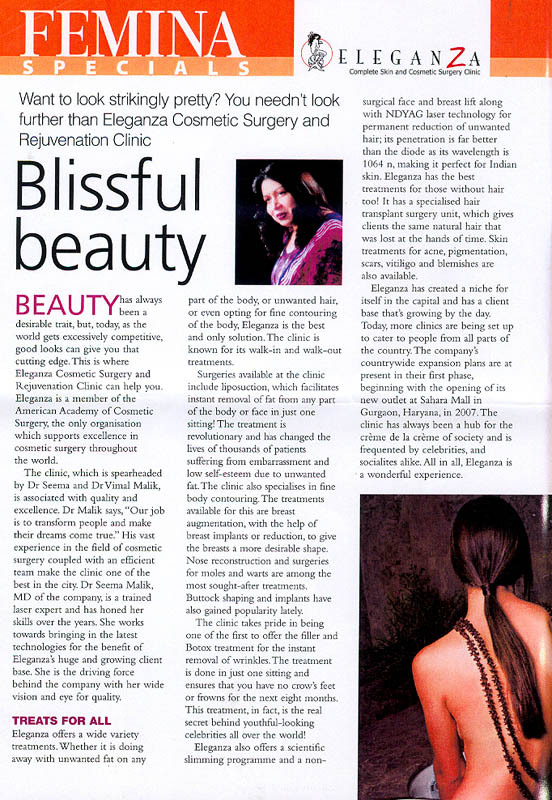 Instant Beauty - "Eleganza is a shoppers stop for beauty under one roof....."
Get that beautiful Bod - "Don't want ugly body hair, acne, scars, moles and wrinkles?....." 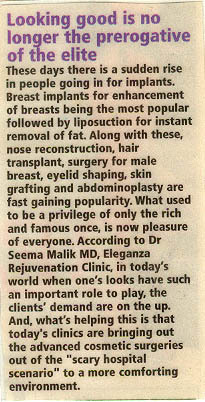 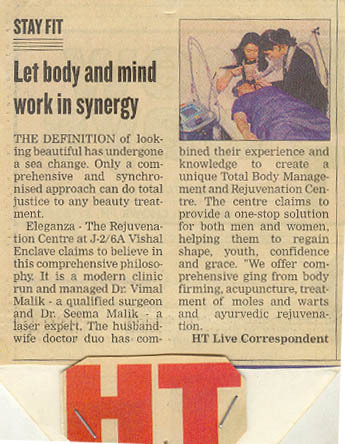 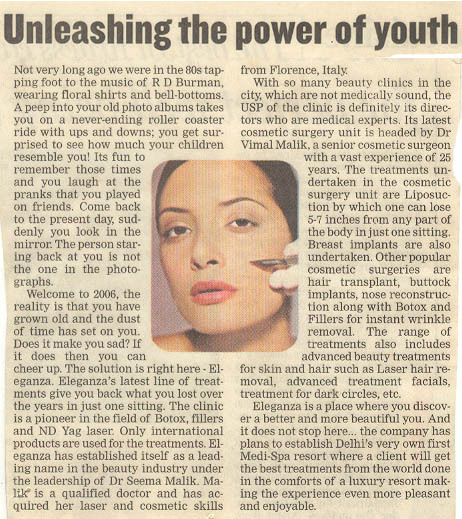 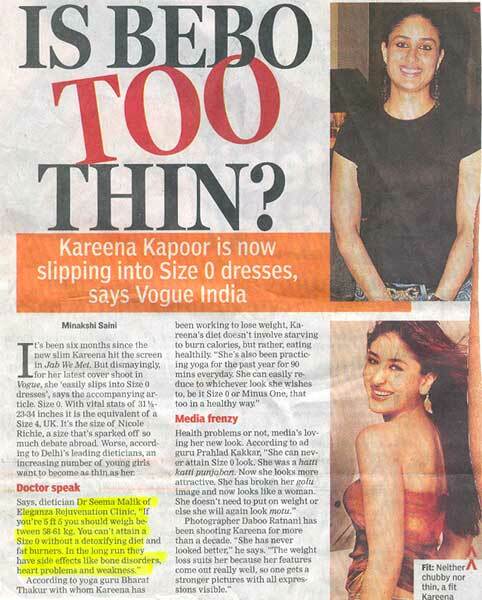 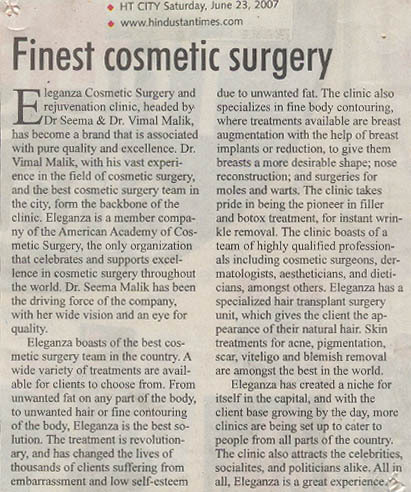 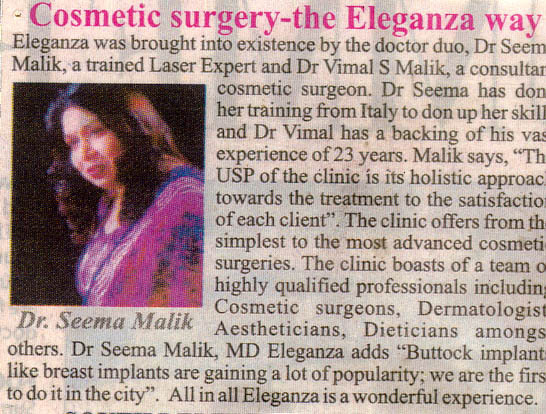 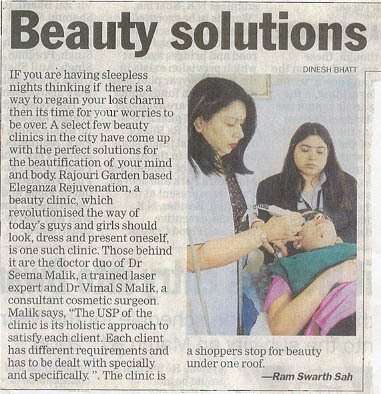 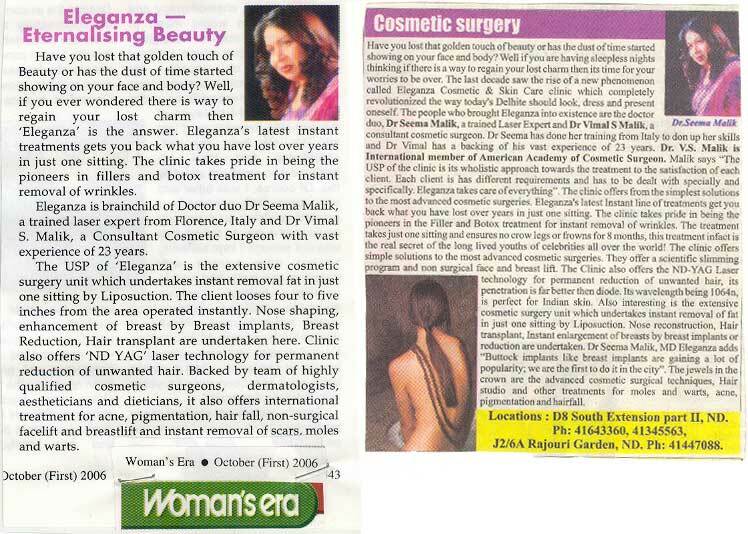 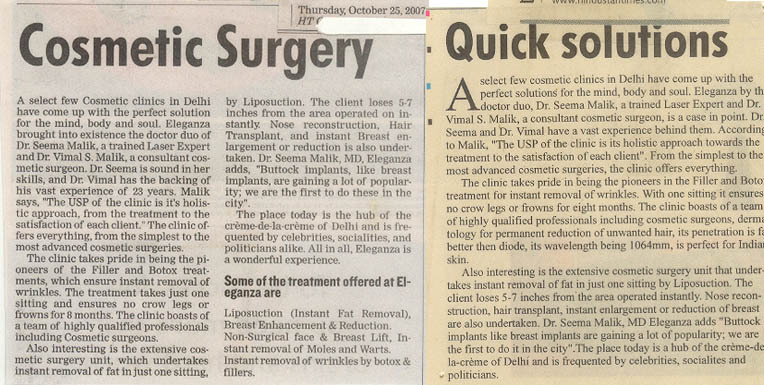 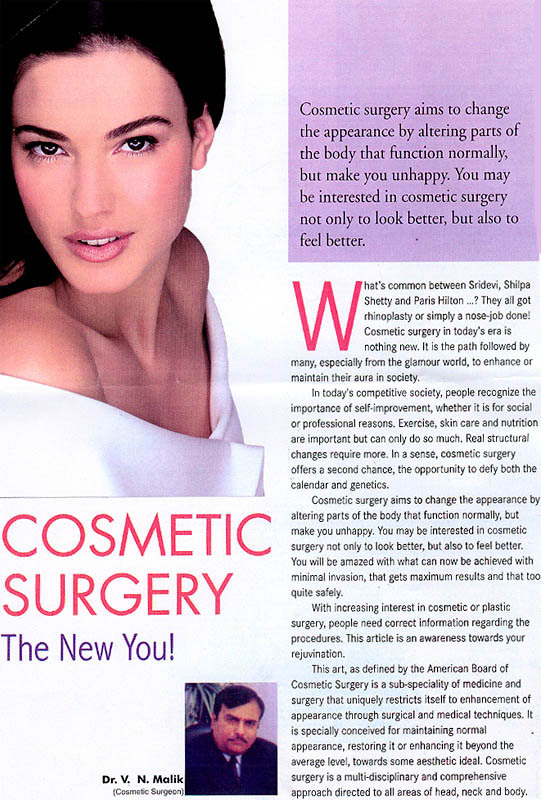 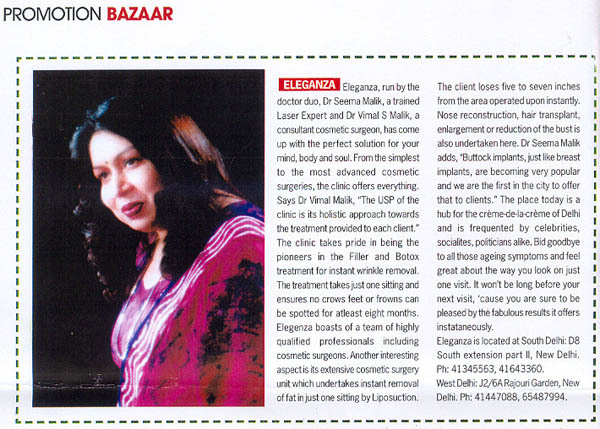 Rediscover yourself at Eleganza - "It does not really seem long when the time was the 80s......"
"Eleganza, run by the trained doctor duo Dr. Seema Malik....."
Eleganza - Eternalising Beauty - "Have you lost that golden touch of Beauty or has the dust......"
Looking good is no longer prerogative of the elite - "These days there is a sudden rise in people going in for implants....."
Cosmetic Surgery - "A select few Cosmetic clinics in Delhi have come up with the perfect......"
Finest cosmetic surgery - "Eleganza Cosmetic Surgery rejuvenation clinic......"
Cosmetic Surgery - The Eleganza way - "Eleganza was brought into existence by the doctor duo, Dr Seema Malik....."
Beauty Solutions - "If you are having sleepless nights thinking if there is a way....."
Let body and mind work in synergy - "THE DEFINATION of looking beautiful has undergone a sea....."
Unleashing the power of youth - "Not very long ago we were in the 80s tapping foot to the music....."
City Scan - "If you want a perfect nose, wrinkle free face, hairless skin or that perfect figure....."
Hair removal by laser has no side effects and leaves no scars - "It is safe to remove hair by laser treatment....."
Is bebo too thin - "Kareena is now slipping into size 0 dresses...."
No if's, Only Butts - "All I need is the rhythm divine... when Enrique Iglesias mouths these words....."
“Do me a favour...let’s play Holi!” crooned a sassy Priyanka Chopra in the song sequence from the Bollywood. 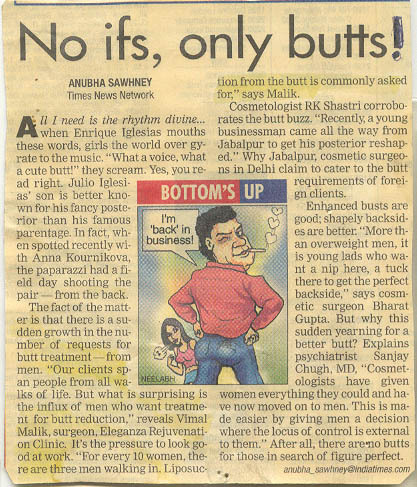 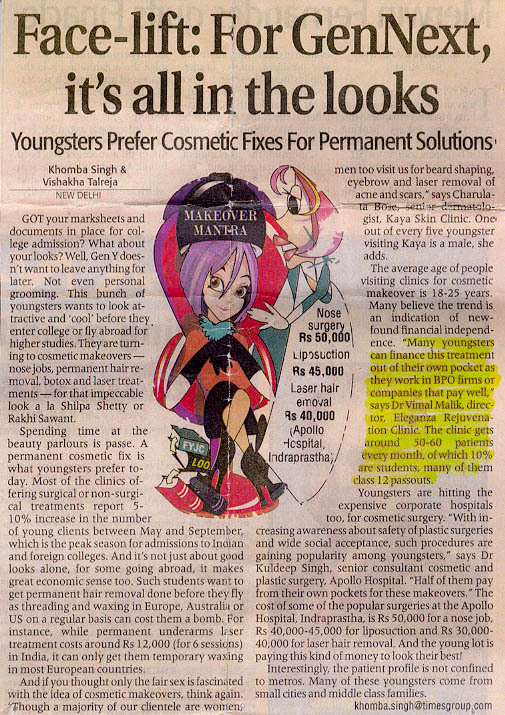 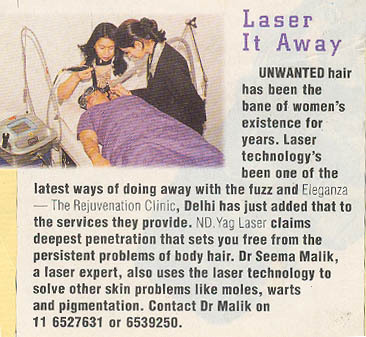 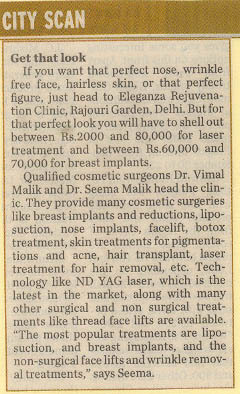 ....."
Laser it Away - "Unwanted hair has been the bane of women's existence for years......"
Blissful Beauty - "Beauty has always desirable trait, but......"
"Face will glow in blistring hot....."
Cosmetic Surgery, The New You - "What's common between Sridevi, Shilpa Shetty and Paris Hilton....."
Face Lift: For GenNext - "Youngster prefer Cosmetic fixes for permanent solutions....."
Botox and Fillers - "Get skin like Childhood....."
Radio Surgery, Perfect Figure, Cute Dimples....."
No Side Effect of Laser Hair Removal..."